The Supreme Court says the government’s literature is not impartial, and therefore an inappropriate use of public money. The government's Children's Rights Referendum website has been found to be "not fair, equal or impartial" by the Supreme Court. THE SUPREME COURT has upheld a challenge against the Government’s informational website and booklet on the Children’s Rights Referendum, finding that the government had “acted wrongfully” in spending money on a website which was “not fair, equal or impartial”. The court this morning upheld a challenge from Dublin resident Mark McCrystal, who had claimed that the ChildrensReferendum.ie website, and a booklet distributed by the Department of Children and Youth Affairs, contained language which effectively advocated a Yes vote in the referendum. The Supreme Court upheld McCrystal’s appeal after it was rejected by the High Court last week – and in a brief ruling today found that there were “extensive passages in the booklet and on the website which do not conform to the McKenna principles”. Those principles, established by the Supreme Court in 1995, found that public funding and resources should not be used in a referendum campaign “to espouse a particular point of view”. Chief Justice Susan Denham, delivering the ruling, said she did not consider it “either appropriate or necessary” to grant an injunction ordering the government to remove the website, however. This was because “it is to be assumed that the respondents will cease distributing and publishing the material”. The website, which had been launched in September, was taken offline at 11:39am this morning. “The Court has concluded that it is clear that there are extensive passages in the booklet and on the website which do not conform to the McKenna principles,” the Chief Justice said. This material includes a misstatement, now admitted to be such, as to the effect of the Referendum. The Court is satisfied that while not all of the website or the booklet are in breach of the McKenna principles, because of the overall structure of the booklet and website, it would not be appropriate for the Court to redact either. 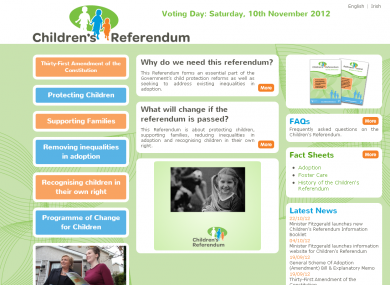 The literature had summarised the effects of the proposed referendum under five headings – ‘Dedicated Constitutional provisions for children’, ‘Protecting children and supporting families’, ‘Removing inequalities’, ‘Adoption: a second chance for children’, and ‘Recognising children in their own right’. The polling order for the referendum is not affected by the ruling – meaning the ballot will still go ahead on Saturday, with counting to begin on Sunday morning – but the judgment could be a blow to the government’s hopes of an easy victory for the Yes side. Denham said the case had been dealt with “as a matter of urgency” by both the High Court and the Supreme Court, given the obvious time pressures at stake in the referendum. While she said the “substance of that [referendum] proposal is a matter for the people alone”, it was up to the court to rule on the matter at hand as soon as possible. A written judgment will be published on December 11. The Government had come under criticism in both this referendum and in May’s vote on the Fiscal Compact, for distributing its own ‘impartial’ information booklets and publishing its own information website on the referendum – an apparent overlap of the role of the Referendum Commission, which has its own separate website and booklet. Although most observers still expect the referendum to be passed on Saturday, the court’s finding – which effectively means the government literature is biased in favour of encouraging a Yes vote – could provide a late boost to the referendum’s opponents. Email “Supreme Court says Government's Referendum site 'not fair, equal or impartial'”. Feedback on “Supreme Court says Government's Referendum site 'not fair, equal or impartial'”.